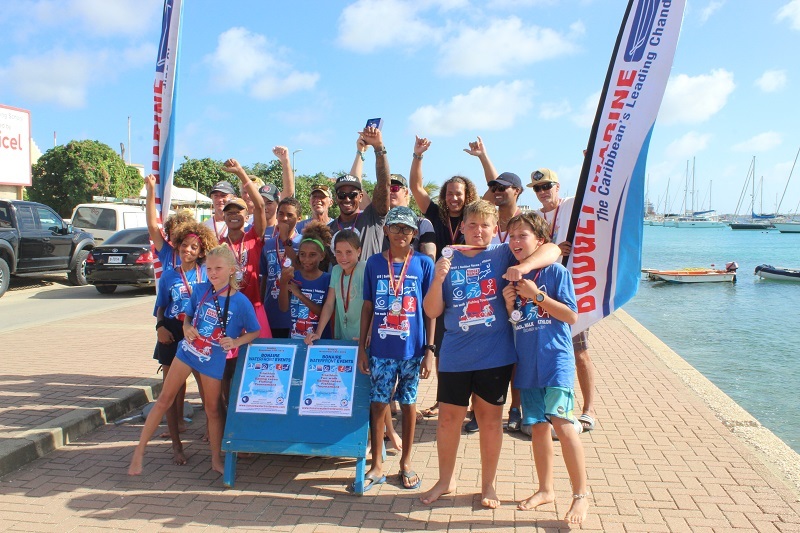 The Bonaire Waterfront Events, powered by Budget Marine Bonaire made for a great day by the Kas di Regatta. The day’s events included a 4 mile /6.4k Walk lead by the Lion’s Club. Zorg Groep BES was available to check the blood sugar for any participants interested. The Sprint Triathlon (a 1/4 triathlon is our “long” distance) which was 750m swim, 20k bicycle and 5k run our mini sprint which was half of those distances. 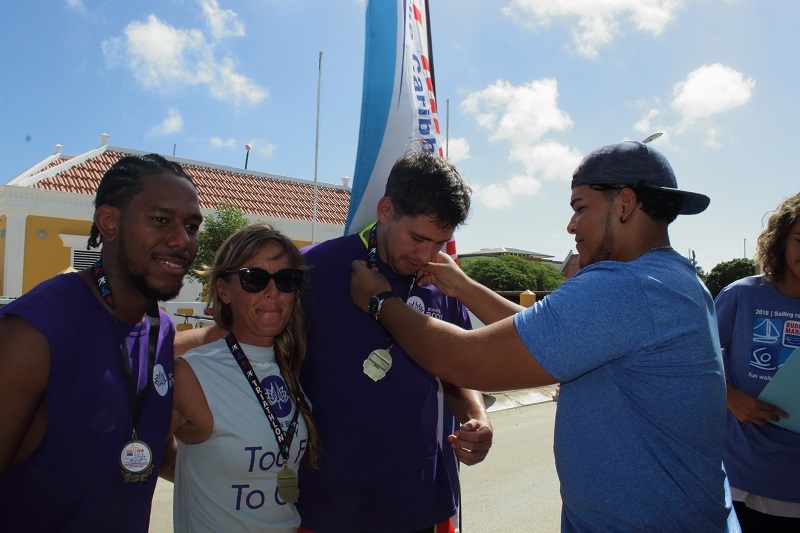 Participants from elite athletes to young kids took part in this event. Rick de Haas was first place finishing in 1:17 in the mens long, followed by Jeffrey Hesselink and Eric Stavoe. Jorieke Haarhuis finished in 1:36 for the women’s first place, followed by Kelly Mettes and Iris Manson Grotenboer. The first team finishing was Peterson, Nick Ruhe and James Granger in 1:11 for the fastest overall time. The mini sprint is a great introduction to triathlons. Mark Norman lead the men’s with a time of 53:10 followed by Frans Roefs and Alexander Yates, our youngest individual participant at 11 years old. Bonnie Roefs was first in the women’s competition finishing in 57:05 followed by Antje Gunther and Sandra Wildebrant. The family team of Hendrik Wuyts, George DeSalvo and Ava Wuyts, also 11 years old finished a just ahead of Iza Benshop, Simon Buys and Luc Benschop. Iza was the youngest competitor at 8 years old who then continued on to compete in an optimist! This is a great family event for young and old. The Sailing featured a new race for hydro foils where the kite and wind surfers competed with each other. Foils use only a “wing” in the water and the board rises up above the water making them very fast. The Amado Vrieswijk on a wind surf foil beat out the others in the strong wind. Gigi won the Optimist C, followed by Didi and Iza. Gilbert bested the group in Optimist B followed by Lena and Quendrick. Optimist A Jeauneau beat out Dante. Jaimemorence took first in the sunfish B leading Nixon and Walter. In Sunfish A Sipke took the lead trailed by Ton and Alex. The Micro boats came out to practice, but with so many yachts out front, we could not make a course wide enough for them this time! Good to see the training, next time we will make space! This year we added a fishing tournament. Here the prizes were for the largest Tuna and Wahoo, both went to Jan on Black Magic. The prize for Dorado stayed in with none caught. Sportsmanship prevails as one of the boats delayed fishing to tow in one of the other fishermen, left again and had to tow in a sail boat with problems. Working for sustainable fishing with the World Wildlife foundation and following the lead of Piskechi (Elvis) we are looking for ways to make fishing competitions interesting yet not fill the fridge with more fish than anyone wants in one day! For this reason we are looking for the largest fish of specific species for the day rather than filling the boat with anything you can catch. 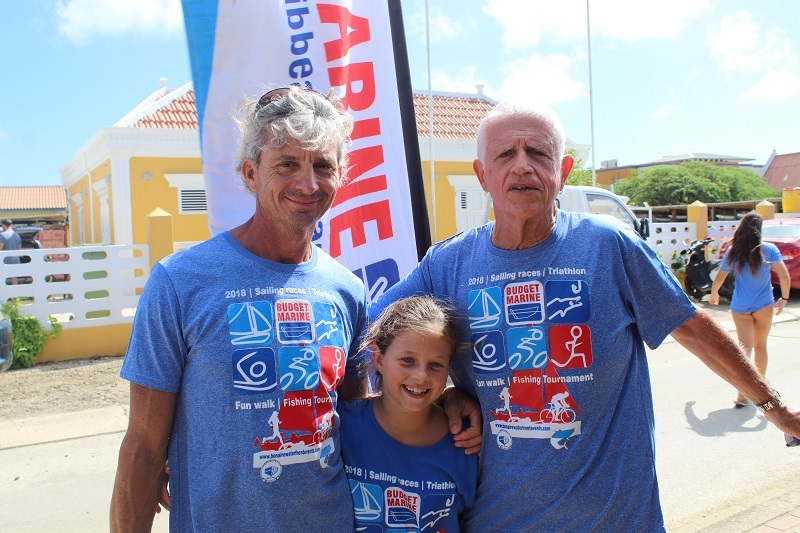 The event was powered by Budget Marine which joined with many groups such as the Diabetes Awareness week of the Zorg group BES, Indebon, Jong Bonaire, Lions, E-zone and many more volunteers and supporters! Without the support of the volunteers and sponsors this would not be possible. Proceeds from this event are going to support the restoration process of the traditional sailing fishing boats. Join us next year on the 10th of November for an even bigger event.